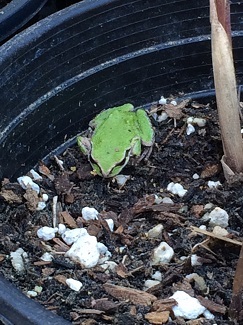 Froggie is busy eating bugs and keeping an eye on the potted up plants that will be FOR SALE at the “Community Garden Club of Camas Washougal’s” annual PLANT SALE on May 19th, 9am-3pm! Sorry he can’t meet you in person. His mama says he has to stay home and work that day. We’ll be posting partial plant lists in the upcoming weeks. Stay tuned!